This recipe can not be complete without those mixed vegetables. I used lemon, cucumber and fresh tomatoes to garnish this dish, but you can use any kind of vegetable. Talking about rice, what do you like about it? Personally, I enjoy eating rice but I try to measure it up with the right amount of fruits and vegetables. For this rice recipe, the long sprinkling of powdered curry and light sprinkling of oil is very helpful. When I perceive the fragrant aroma cooking away in the rice cooker, I get so hungry and anxious to start eating ASAP. Rice is of the plant Oryza sativa or Oryza glaberrima and the most widely cultivated and consumed staple food of the human population. It is the most vital grain beneficial to both our nutrition and caloric intake. Rice can be short, medium or long sized and each of the different sizes is used for different recipes. It can be grown either organically or inorganically. How do you make your own rice recipe? Do you just add your rice into the pot with water and start cooking or do you wash, cook for few minutes, rinse again before finally cooking it till it gets done? Basically, I make sure I cook briefly, rinse and then finally cook till done..... This is what is termed parboiling! 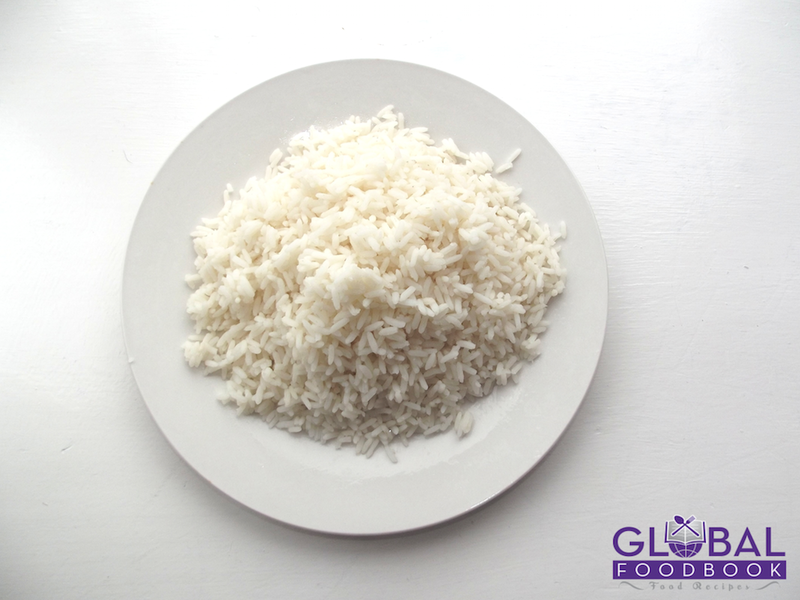 It is important to parboil and rinse rice before cooking so as to get rid of excess starch however, this is not the case with those produced in the United States of America that are often fortified with minerals and vitamins as rinsing will lead to loss of nutrients. Parboiling improves both the taste and texture of the rice. While cooking rice, it is important to ensure that the volume of water added, is proportionate to the volume of rice so that the rice doesn't get too soft and unsuitable for consumption. Rice is a rich source of Carbohydrates,Thiamine (B1), Energy, Phosphorus, Riboflavin (B2), Zinc , Niacin (B3), Pantothenic acid (B5), Potassium, Magnesium, Vitamin B6, Calcium, Manganese, Iron. Like the title of the recipe suggests, this is a curry rice recipe..... Do you think that powdered curry spice plays a great role in giving this recipe that so desired colourful appearance? Absolutely, the yellowish appearance of this rice dish is from the much added powdered curry spice during the preparation. Curry powder is a spicy mixture of ground coriander, turmeric, cumin, chilli powder and ground ginger which can have a very strong strength, medium or mild taste. With the addition of curry powder, the rice came out so colourful and enticing. Garnishing the rice dish with tomatoes, lemon and cucumber is just the tip of the Iceberg! Wash and season meat with thyme, salt, stock cube, ginger, onions and garlic and cook on a high heat until soft and tender. Bring down from heat and set aside. Meanwhile, parboil rice by cooking for 5mins, washing and draining out starchy water. (set aside). Afterwards add the meat broth into the drained parboiled rice, add curry, stock cube, pepper, turmeric, and pepper. Stir well and allow to cook until slightly done. Bring down from fire. Then heat up oil on a low heat, stir in onions, green peas and bell pepper. 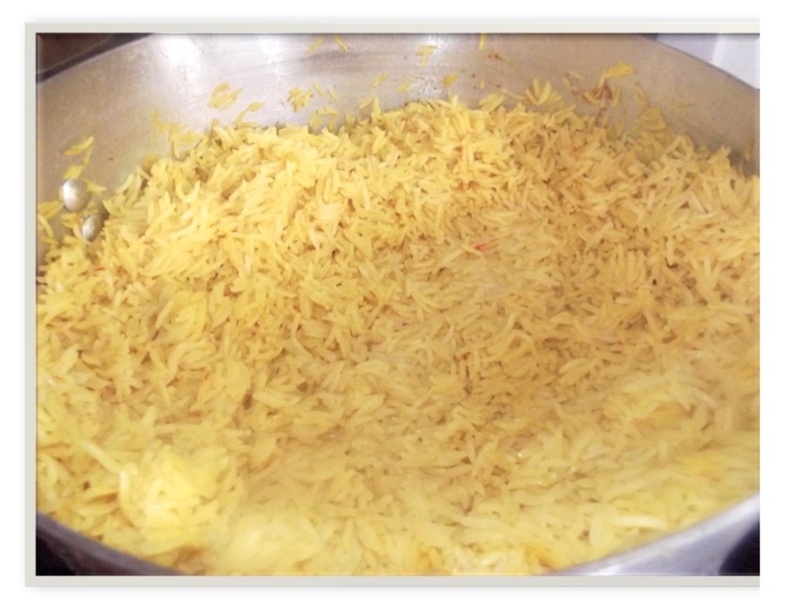 Continue stirring the vegetables until done, then pour into the already boiled rice and mix thoroughly. 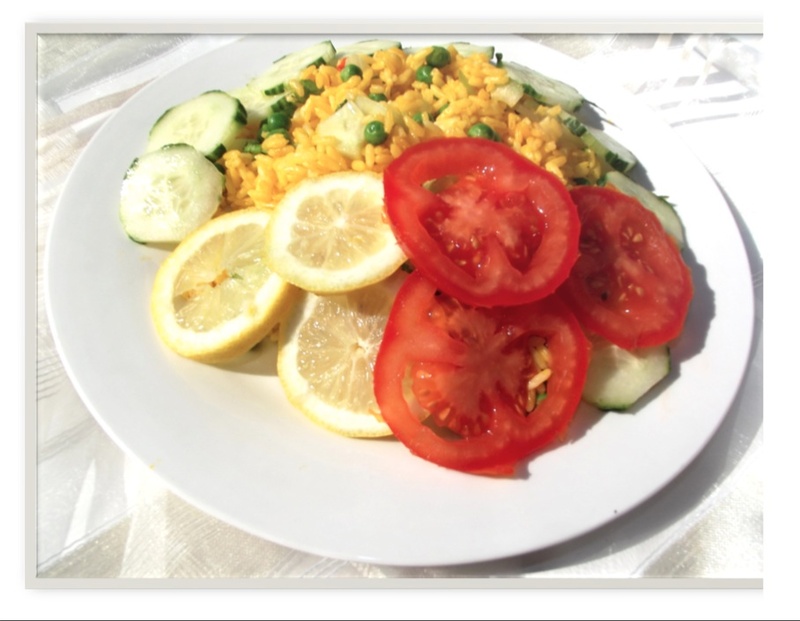 Serve curry vegetable rice dish garnished with fresh tomatoes, lemon and cucumber.